In 1982, Carlos Tortolero organized a group of fellow educators and founded the Mexican Fine Arts Center Museum which opened its doors in 1987. The goal was to establish an arts and cultural organization committed to accessibility, education and social justice. The museum also provided a positive influence for the local Mexican community, especially since many other art institutions did not address Mexican art. Over the years, the institution has grown its audience, has broadened and its reach now extends across the United States and beyond. 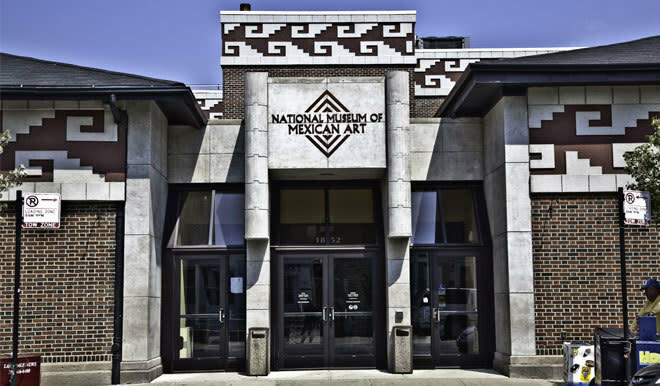 To support this evolution, in 2001, the museum expanded to a 48,000 square-foot, state-of-the-art facility in the heart of Pilsen and in 2006 we unveiled a new name, the National Museum of Mexican Art. While our presence has grown, the NMMA remains true to our founding mission: To showcase the beauty and richness of Mexican culture by sponsoring events and presenting exhibitions that exemplify the majestic variety of visual and performing arts in the Mexican culture; to develop, conserve and preserve a significant permanent collection of Mexican art; to encourage the professional development of Mexican artists; and offer art education programs. Today, the NMMA stands out as one of the most prominent first-voice institutions for Mexican art and culture in the United States. We are home to one of the country’s largest Mexican art collections, including more than 7,000 seminal pieces from ancient Mexico to the present.